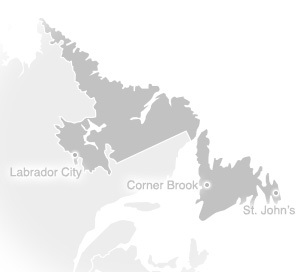 The western region is a great sliver of land on Newfoundland’s island, stretching 750 kilometres from Channel-Port aux Basques on the southwest corner, to the Viking site of L’Anse aux Meadows at the tip of the Great Northern Peninsula. With ancient mountains, fjords, icebergs, whales, thousands of miles of coastline and two UNESCO World Heritage Sites, this wild and rugged regions sports abundant breathing room and diverse natural heritage. It’s also home to the International Appalachian Trail, which extends from Mount Katahdin, Maine, through Eastern Canada and stretches fully across the western region of Newfoundland Labrador, before extending into Europe. The land found here has a unique geological history dating back 1.25 billion years, not to mention a human history spanning 4,500 years, which is still being researched and discovered today. You’ll find Gros Morne National Park here, a UNESCO World Heritage Site stretching across 1,805 square kilometres, encompassing the towering Long Range Mountains and the unique Tablelands. The park offers more than 100 kilometres of hiking trails, many passing through fascinating rock formations thrown up from the earth’s core due to tectonic upheaval. Stumble across the first European settlement of the new world at L’Anse aux Meadows. This Viking village, yet another UNESCO World Heritage Site, features a reconstructed complex of sod huts that offers a glimpse into the life of Nordic visitors a thousand years ago. A journey heading south will take you to the City of Corner Brook on the west coast, a sizable hub of activity just five minutes away from the world-class ski resort, Marble Mountain. At Marble, you’ll find yourself standing at the base of a 1,700-foot vertical drop that receives an average 16 feet of annual, natural snowfall. As well as offering skiing and snowboarding, there are 1,250 kilometres of trails for snowmobiling in the winter. Here in the wild west of the far east of North America, you’ll find scenery to take your breath away. It’s a place of mountains, a place of conservation areas like the Codroy Valley International Wetlands, where you can watch wildlife like moose, caribou and migratory birds. It’s a place where you can plan boat trips, go kayaking, hiking and even visit secluded sandy beaches. It’s also full of culture, so be sure to make time for some high-level theatre, music and art along the way.